The Complete Guide + Personal Website Review! 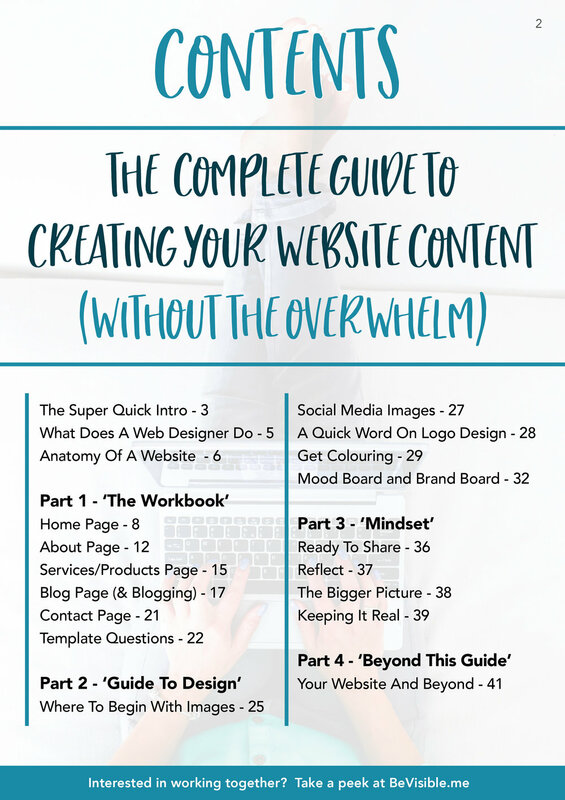 Maybe you’ve already downloaded the FREE guide and want more… or maybe you’ve decided to jump straight in and go for it! 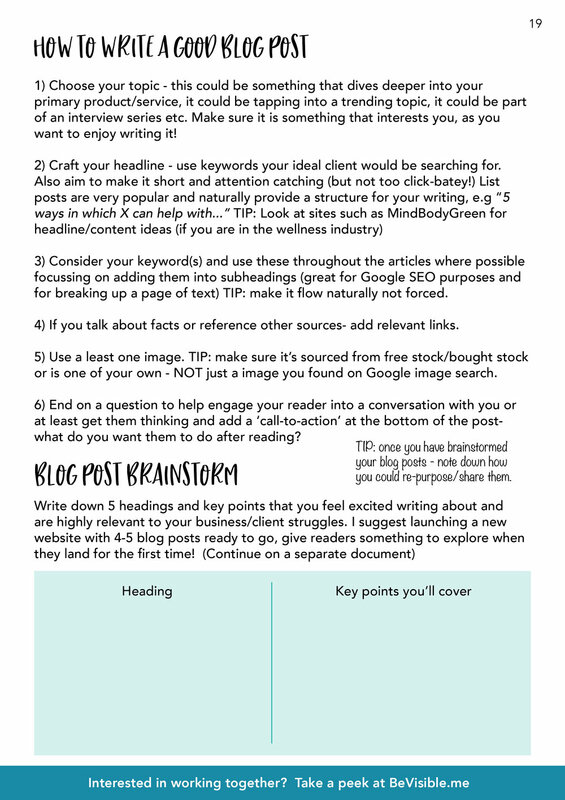 This is a complete guide to support you step-by-step in writing great content for the main pages of your new website (or website revamp), sourcing the correct imagery to use within the website and getting a handle on the colours and styling so that you can most effectively supply your website designer (or yourself if you are self-building) with high quality content to work with for the design process. 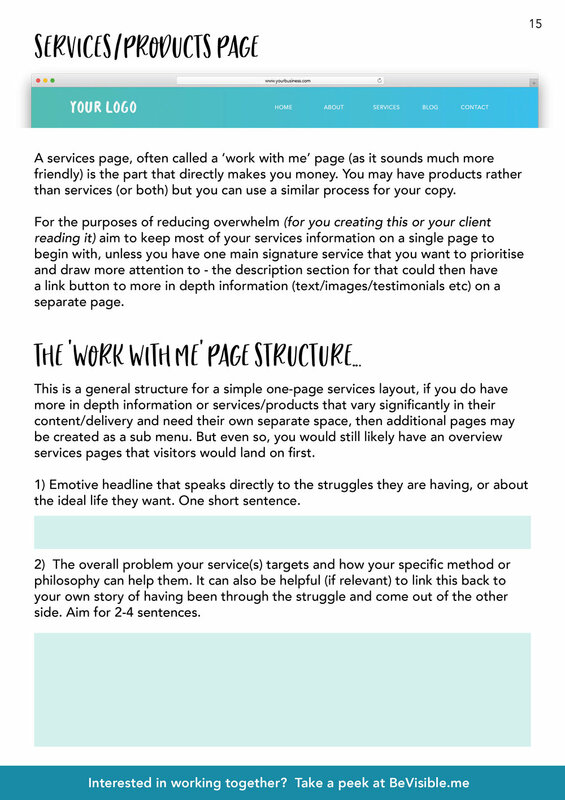 The ‘Workbook’ section is designed such that it can be filled out and submitted to your designer, although of course you could just write your notes directly into a text document using the headings provided in the guide. 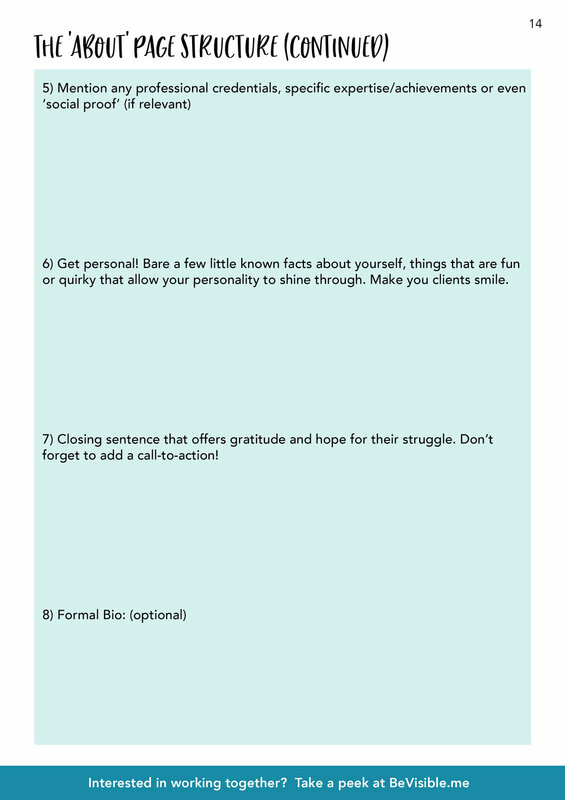 Last but not least, it is also a guide to support your mindset as you launch your new website into the big wide world. A north star to help you stay connected and aligned with your mission. “Your website is your personal platform to really make a difference in the world. 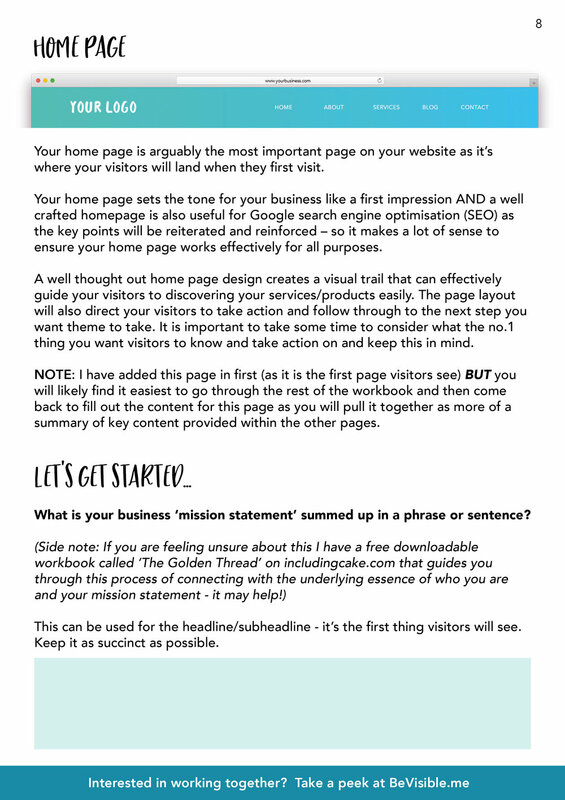 If you have decided to go ahead and design and build you own website using the guide… first of all let me give you a * high five *, it’s a labour of love for sure and you may feel like pulling your hair out at times, but it’s well worth it if you dig deep and persevere. Ultimately you’ll have a beautiful website, but you know what’s REALLY beautiful? The person YOU become through its creation. When you purchase this guide and work through all the steps to launch your website. I want to offer you an extra special bonus gift! A personal website review in which I combine both my coaching and design skills to offer actionable feedback and a fresh perspective to help elevate and optimise the way you connect with your ideal clients. Work through and implement ‘The Complete Guide’ in the way that best serves you and your business. Once complete and your site is launched, email me the link to your new website with the subject line of the email 'BeVisible new website review'. Please also confirm that you purchased the guide by letting me know the email address associated with you purchase and date of purchase. - a description of your business summarised up in a sentence. FYI, I request that this information is provided in a separate document and NOT in the body of the email itself as I do not want to read and be influenced by this information until I have first had an initial review of your site through fresh eyes. 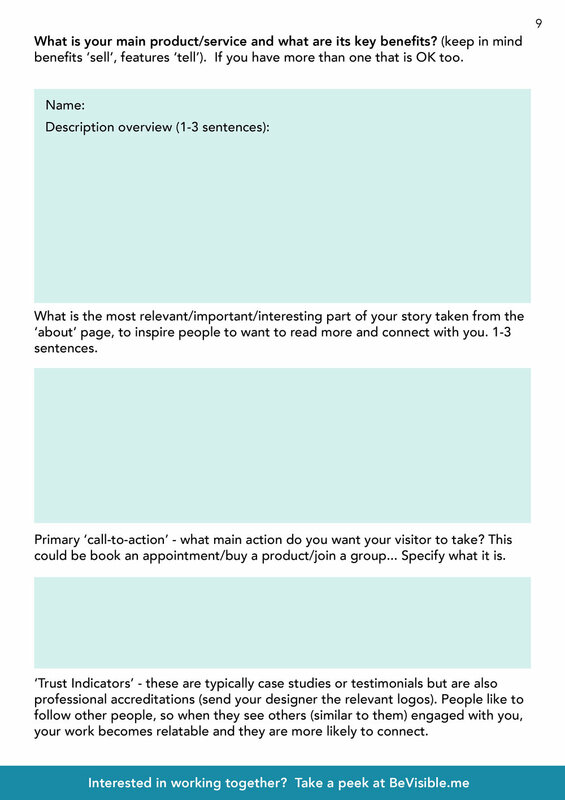 My review of your website summarised as a walk-through screen share video, sharing my detailed thoughts on how your message is currently communicated from both a physical (design based) and emotional (coaching based) perspective, with actionable steps to take if you choose to. I aim to provide a review within 48 hours of receipt of your email. If you decide at a later date that you’d like to work together within a coaching-led design process, I am here for you! Check out my packages and get in touch.